Sticker shock? Remember that studying abroad is a long-term investment in your future. Annually, the IUPUI Study Abroad Office gives away $70,000 in scholarship money. Last year, IU students used more than $9 million in loans, grants, and scholarships to study abroad. However, you should never rely on scholarships to completely fund your program and be prepared to make certain program payments in advance. Are you already receiving financial aid? Awards and grants may be applicable to your study abroad program. Financial aid is not disbursed until the beginning of the term in which you study abroad. Contact your financial aid advisor early to determine your financial aid eligibility and make sure your aid information is accurate. Will my financial aid apply to my program? Existing financial aid is a great source of funding for long-term programs, like semester and academic year programs.Most financial aid may be applied to IUPUI and IU-sponsored programs, but there are some exceptions. Please check with the IUPUI Office of Student Financial Services for questions regarding your aid. Does this apply to a summer program? Summer financial aid is usually in the form of loans, grants, or scholarships. For summer study abroad, you must register for at least 6 credits over both summer sessions which can be a combination of on and off campus coursework. Financial aid shouldn't be so difficult. And with careful financial planning, short- and long-term programs could be more affordable than you would expect! Check out MoneyGeek's financial planning tips and additional scholarship and financial aid information. Madison Harris and Cari Knip received the Beaudry Summer Scholarship for French and Francophone Studies in May 2014 to help fund their summers in France on the French Language Studies Program. This is one of many study abroad scholarships offered by the IU School of Liberal Arts at IUPUI. But really, where’s the dough? We want to help you find scholarships to fund your trip abroad. Our office offers scholarships twice a year, based on financial need and academic merit. Many departments on campus also offer scholarships. Check with your school and department administrators for the most recent scholarship information. Don’t forget about your existing scholarship money! Finding scholarships applicable to your program or academic interests may take some searching. It’s never too early to start looking for potential scholarships. If you study abroad on a co-sponsored program (e.g., IES, CIEE), you may be eligible for their scholarships. IU Bloomington offers scholarships for students from other IU campuses, minority scholarship, and internship incentive grants. Check out available scholarships below. The IUPUI International Experience Scholarship has two award cycles per year. Preference will be given to students who have never had an opportunity to study overseas. Please read the detailed description and eligibility information below before applying. The Shreve Study Abroad Scholarship was created in order to support and encourage global learning for IUPUI undergraduate students through participation in an approved study abroad program. Please read the detailed description and eligibility information below before applying. Up to $2,000 awarded to a full-time Herron student to travel with a Herron sponsored international program. Student must have a minimum overall GPA of 3.30. The application for this award is included in the application to all Herron study abroad programs. Approximately $500 will be awarded to Herron students who have demonstrated superior talent and skills and an interest in pursuing art studies in the US or abroad. The application for this award is included in the application to all Herron study abroad programs. Approximately $1,500 will be awarded to full-time, undergraduate students pursuing a degree in fine arts by participating in a residential artistic studio environment located abroad. For more information, contact Herron Student Services, HR 126; (317) 278-9400. Visit the Kelley Undergraduate Scholarship website for the most updated information. For a full listing of scholarships offered by the School of Liberal Arts, visit the website here. Up to $1,500 will be awarded per year to a student who has been accepted to an accredited international study program or enrolled in a Liberal Arts course that contains an international component that requires travel outside the United States of America. The recipients should have demonstrated financial need, as determined by standard university measures. 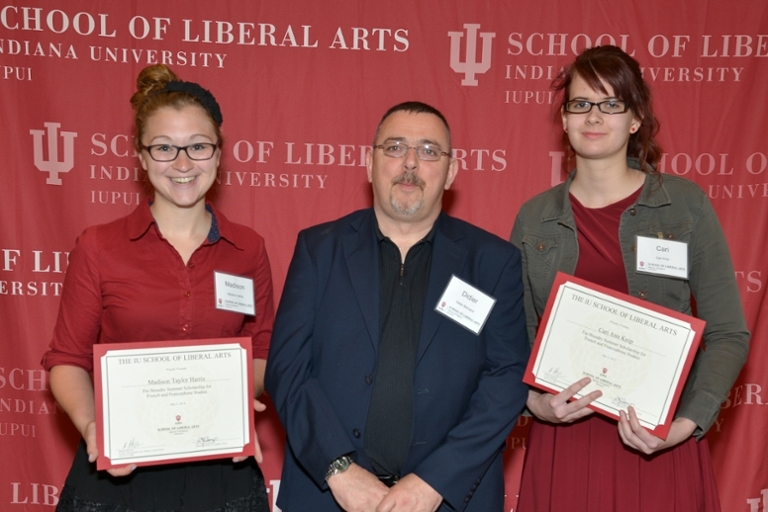 Recipients must be undergraduate students in the IU School of Liberal Arts. Up to 1/3 of approved program costs for students studying abroad for a semester or year long program. Recipients must be undergraduate students in the IU School of Liberal Arts. This scholarship of up to $1,200 promotes and encourages the cultural and linguistic development of IUPUI students majoring or minoring in French by funding student participation in a academically approved foreign study programs in a French-speaking country during the summer session. IUPUI undergraduate French major preferred (may be an IUPUI French minor). This scholarship is awarded to an undergraduate student who is enrolled part or full time, majoring in the Department of World Languages and Cultures, or is enrolled in the Individualized Major Program with a world language concentration, and who has a record of academic excellence. Preference will be given to a student who has demonstrated service to their language discipline. $1,000+ will be awarded for the summer or academic year. Recipients must be undergraduate or graduate students in the IU School of Liberal Arts involved in a project or program where students learn through their engagement with the community regardless of the physical location of the activity (i.e., it may be international as well as local). Faculty, who will serve as mentor to the student, will nominate recipients. The Department of World Languages and Cultures faculty honor a student who has demonstrated excellence in the study of the French language, culture, literature, and linguistics. This $1,000 scholarship is awarded each year to an outstanding student who has declared a major in French language and literature at IUPUI. Not specifically for study abroad, but it would nevertheless assist the student in participating in a program abroad. Two $500 scholarships, for studying German in an approved study abroad program. Open to German majors or minors, as well as other majors who will earn credits toward their degrees. For more information, contact the IU School of Liberal Arts or contact Dr. Claudia Grossmann, (317) 274-3943 or cgrossma@iupui.edu. Award of up to $500. Provides support to undergraduate IUPUI Spanish majors and graduate students in the IUPUI Spanish M.A.T. for Spanish language study abroad programs. (Preference given for participation in the Salamanca and Pachuca programs). $500 award. Eligible candidates will be students majoring in a School of Liberal Arts discipline and enrolled in an accredited study abroad program for a semester or year-long academic program. In selecting recipients, preference will be given to students majoring in history or graduate students in history. Two $2,000 awards for School of Informatics and Computing undergraduate students who have completed their sophomore year. Application available online. Available to students in the School of Engineering And Technology who are planning to study abroad during the calendar year. Amounts vary, typically between $500 - $1,000. Award amounts and the number of scholarships are dependent on the money in the fund. A committee of School faculty and staff will select the recipients. For more information, contact Dr. Terri Talbert-Hatch, ET 215D, (317) 274-8703, ttalbert@iupui.edu. The purpose of the Travel Grant is to help Honors Program students participate in a Study Abroad experience or a conference in their area of study. Only Engineering & Technology Honors Program Students can apply. Honors College scholars are not eligible even if they are Engineering & Technology Students. The grant award is up to $2,000. Click here to apply. Applications must be submitted to Susan Bradley (susjbrad@iupui.edu or ET 215N in the Office of Academic Affairs and Undergraduate Programs). Eligible students are those who plan to participate in approved programs that offer service or project-based learning. Students must be enrolled in a degree program offered by E&T. For more information, contact team8ols@iupui.edu, attn Prof. Timothy Diemer. Check into other scholarships for student in the School of Engineering and Technology here. Designed to support and encourage international educational experiences for students through participation in approved, credit-bearing study abroad courses. More information is available on the Lilly Family School of Philanthropy website. Scholarship Amount: $1,500 to enable students to participate in the Research, International, Service Learning, and Experiential Learning (RISE) activities for which the scholarship is named. For more information or to apply, click here. The School of Nursing provides up to $1,200 in scholarship support for undergraduate students participating in coursework abroad. Through the Charlotte A. Carlley/Jean E. Schweer Mentorship in Cross-Cultural Studies Fund and the International Learning Experience Program Fund, students may be awarded support for course expenses. Criteria for selection include GPA, an essay on learning goals and relevance of course to program outcomes, and strong letters of support. Application available online. For more information, contact Prof. Mary Riner, mriner@iu.edu. DEADLINE: last Friday in February. Explore other School of Nursing Scholarships here (Annual deadline: March 31st). The Department of Tourism, Conventions, and Event Management (TCEM) awards the Efroymson-Tourism Management Study Abroad Award to a minimum of one student to study abroad for one semester in Germany. Minority students and those with financial need are encouraged to apply. Application available online. For more information, contact TCEM: (317) 278-7439, tcemdept@iupui.edu. The Department of Tourism, Conventions, and Event Management (TCEM) awards the Efroymson-Tourism Management Study Abroad Awards to three students who plan to enroll in the Cruise Line Management study abroad program (to offset travel expenses). Minority students and those with financial need are encouraged to apply. The study abroad program takes place over spring break. Application available online. For more information, contact TCEM: (317) 278-7439, tcemdept@iupui.edu. This scholarship is given to up to five students who plan to enroll in the summer study abroad experience in Heilbronn, Germany. This is a three-week experience that will take place during summer session I in June 2016. Upon return, recipients will be required to complete a reflective essay or give a presentation to classmates detailing their cultural experience in Germany. Application available online. Explore other PETM and TCEM Scholarships here. SPEA undergraduate students participating on a SPEA overseas program (offered either through Indianapolis or Bloomington) will receive a scholarship of up to $1,500. SPEA students can apply for additional competitive scholarship awards from SPEA that range between $500 and $1,500. More information on these competitive awards is available on the SPEA Overseas Education Programs website. SPEA Overseas Education Scholarships may only be applied to SPEA-sanctioned programs, i.e. SPEA Summer Abroad Programs or SPEA Semester/Academic Year Abroad Programs. Students must be admitted to a SPEA undergraduate degree program at IUB or IUPUI. Students admitted for a fall semester will be eligible for scholarship support in the prior summer (for example, a student admitted for Fall 2015 will be eligible for the scholarship for a Summer 2015 SPEA Abroad program). Students taking their final course requirements in a SPEA Abroad program are still eligible for this scholarship. For more information contact: Kristine Schuster, BS 3025 B, (317) 278-1578, kschuster@iu.edu. DEADLINE for competitive awards: March 1. The Indumati Sukhatme RISE - Study Abroad scholarship provides support for a continuing Science major who is enhancing his or her educational experience through studying abroad. DEADLINE: February 1. For more information, contact Molly Rondeau, LD 222, (317) 274-0672, mrondeau@iupui.edu. Apply here. The William H. and Elizabeth M. Reid RISE – Study Abroad Scholarship honors the Reid’s legacy and supports outstanding undergraduate students from the School of Science who participate in an international experience. The RISE-Study Abroad scholarship provides support for an undegraduate Science major who participates in an international experience, with preference given to an oversees experience in China or the United Kingdom. Explore other School of Science scholarships here. IU Bloomington Office of Overseas Study provides a variety of scholarships available to students participating on their programs. Fund for Education Abroad—Scholarships for undergraduate students with financial need who wish to study abroad. Students must be U.S. citizens or permanent residents. Study abroad programs must be eligible for academic credit at the student's home institution, and must be at least 4 weeks (28 days) long. See website for details and eligibility criteria, or to apply. Deadline: January. Killam Fellowships Program—Application deadline for the Open Competition: January 31. The Killam Fellowships Program is a unique exchange opportunity that offers American undergraduate students the chance to spend either one semester or a full academic year studying at a university in Canada. The fellowship carries a value of $5,000 per semester, and includes a health coverage allowance. The program also includes two three-day enrichment seminars in the fall and spring that are held in Ottawa, ON, and Washington, DC, respectively, as well as funding to travel within Canada to support students pursuing additional cultural experiences. MoneyGeek—Additional need-based and merit-based scholarships. Students participating on non-IU programs are encouraged to check with their program/provider about program specific scholarships. Non-IU program participants must also work with the Study Abroad Office to assure use of financial aid and transfer credit processing. Additional information is available on our Non-IU Program webpage. CIEE—Scholarships avabile for students participating on CIEE programs. Applications are reviewed on a rolling basis. IES Abroad—Scholarships are available for students participating on IES Abroad programs. Funds are limited and applications are reviewed on a rolling basis. IFSA-Butler—Multiple scholarships are available for students participating on IFSA programs. Apply by completing scholarship applications through IFSA. The IUPUI International Experience Scholarship has two award cycles per year. Preference will be given to students who have never had an opportunity to study overseas. Please read the detailed description and eligibility information below before applying. Note that graduate students are only eligible if their international experience takes place during the summer term. Global Learning and Research in Nursing: The School of Nursing provides up to $1,200 in scholarship support for graduate students participating in coursework abroad. Through the Charlotte A. Carlley/Jean E. Schweer Mentorship in Cross-Cultural Studies Fund and the International Learning Experience Program Fund, students may be awarded support for course expenses. Criteria for selection include GPA, an essay on learning goals and relevance of course to program outcomes, and strong letters of support. Application available online. For more information, contact Prof. Mary Beth Riner, mriner@iu.edu. Designed to support and encourage international educational experiences for students through participation in approved, credit-bearing study abroad courses. More information is available on the Lilly Family School of Philathropy website. SPEA graduate students participating on a SPEA overseas program (offered either through Indianapolis or Bloomington) will receive a scholarship of $500. For more information contact: Kristine Schuster, BS 3025 B, (317) 278-1578, kschuste@iu.edu. Wallace International Scholarship Fund — Available to Social Work students. Be sure to explore other continuing student scholarships here. Graduate Student Exchange Program—Indiana University maintains exchange agreements with top universities around the world that provide important study and research opportunities for graduate students. Because the purpose and duration of the programs listed below differ by institution, please review the descriptions of each program carefully. A complete list of grants is available through the Office of the Vice President for International Affairs. Rhodes Scholarship—for study at the University of Oxford.